The packet-switching methodology employed in the ARPANET was based on concepts and designs by Leonard Kleinrock, Paul Baran, Donald Davies, and Lawrence Roberts. The TCP/IP communications protocols were developed for the ARPANET by computer scientists Robert Kahn and Vint Cerf, and incorporated concepts from the French CYCLADES project directed by Louis Pouzin. Meanwhile, since the early 1960s, Paul Baran at the RAND Corporation had been researching systems that could survive nuclear war and developed the idea of distributed adaptive message block switching. Donald Davies at the United Kingdom's National Physical Laboratory (NPL) independently invented the same concept in 1965. His work, presented by a colleague, initially caught the attention of ARPANET developers at a conference in Gatlinburg, Tennessee, in October 1967. He gave the first public demonstration, having coined the term packet switching, on 5 August 1968 and incorporated it into the NPL network in England. Elizabeth Feinler created the first Resource Handbook for ARPANET in 1969 which led to the development of the ARPANET directory. The directory, built by Feinler and a team made it possible to navigate the ARPANET. Larry Roberts at ARPA applied Davies' concepts of packet switching for the ARPANET. The NPL network followed by the ARPANET were the first two networks in the world to use packet switching, and were themselves connected together in 1973. By mid-1968, Roberts had prepared a complete plan for the computer network and gave a report to Taylor on June 3, who approved it on June 21. After approval by ARPA, a Request for Quotation (RFQ) was issued for 140 potential bidders. Most computer science companies regarded the ARPA proposal as outlandish, and only twelve submitted bids to build a network; of the twelve, ARPA regarded only four as top-rank contractors. At year's end, ARPA considered only two contractors, and awarded the contract to build the network to Bolt, Beranek and Newman Inc. (BBN) on 7 April 1969. The initial, seven-person BBN team were much aided by the technical specificity of their response to the ARPA RFQ, and thus quickly produced the first working system. This team was led by Frank Heart and included Robert Kahn. The BBN-proposed network closely followed Roberts' ARPA plan: a network composed of small computers called Interface Message Processors (or IMPs), similar to the later concept of routers, that functioned as gateways interconnecting local resources. At each site, the IMPs performed store-and-forward packet switching functions, and were interconnected with leased lines via telecommunication data sets (modems), with initial data rates of 56kbit/s. The host computers were connected to the IMPs via custom serial communication interfaces. The system, including the hardware and the packet switching software, was designed and installed in nine months. The BBN team continued to interact with the NPL team. The first-generation IMPs were built by BBN Technologies using a rugged computer version of the Honeywell DDP-516 computer configured with 24KB of expandable magnetic-core memory, and a 16-channel Direct Multiplex Control (DMC) direct memory access unit. The DMC established custom interfaces with each of the host computers and modems. In addition to the front-panel lamps, the DDP-516 computer also features a special set of 24 indicator lamps showing the status of the IMP communication channels. Each IMP could support up to four local hosts, and could communicate with up to six remote IMPs via early Digital Signal 0 leased telephone lines. The network connected one computer in Utah with three in California. Later, the Department of Defense allowed the universities to join the network for sharing hardware and software resources. Paul Baran, the first to build a theoretical model for communication using packet switching, conducted the RAND study referenced above. 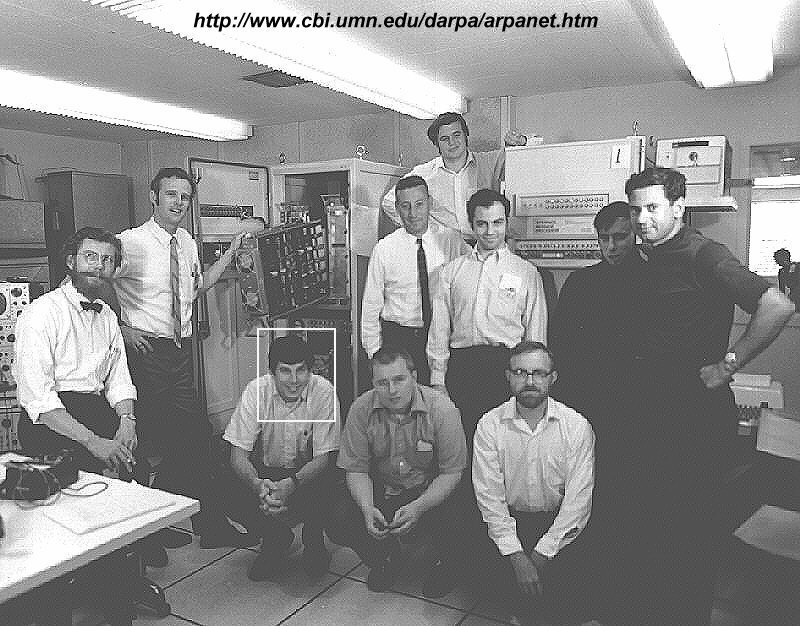 Baran confirmed that though the ARPANET did not exactly share his project's goal, his work had greatly contributed to the development of the ARPANET. Minutes taken by Elmer Shapiro of Stanford Research Institute at the ARPANET design meeting of 9–10 October 1967 indicate that a version of Baran's routing method and suggestion of using a fixed packet size was expected to be employed. In 1973, a transatlantic satellite link connected the Norwegian Seismic Array (NORSAR) to the ARPANET, making Norway the first country outside the US to be connected to the network. At about the same time a terrestrial circuit added a London IMP. The Purdy Polynomial hash algorithm was developed for the ARPANET to protect passwords in 1971 at the request of Larry Roberts, head of ARPA at that time. It computed a polynomials of degree 224 + 17 modulo the 64-bit prime p = 264 − 59. The algorithm was later sequence used by Digital Equipment Corporation (DEC) to hash passwords in the VMS operating system and is still being used for this purpose. Computer Networks: The Heralds of Resource Sharing, a 30-minute documentary film featuring Fernando J. Corbató, J. C. R. Licklider, Lawrence G. Roberts, Robert Kahn, Frank Heart, William R. Sutherland, Richard W. Watson, John R. Pasta, Donald W. Davies, and economist, George W. Mitchell. The 1993 television series The X-Files featured the ARPANET in a season 5 episode, titled "Unusual Suspects". John Fitzgerald Byers offers to help Susan Modeski (known as Holly ... "just like the sugar") by hacking into the ARPANET to obtain sensitive information. ^ L. A. Lievrouw, Handbook of New Media: Student Edition (p. 253) (edited by L. A. Lievrouw, S. M. Livingstone), published by SAGE 2006 (abridged, reprint, revised), 475 pages, ISBN 1412918731 [Retrieved 2015-08-15]. ^ G. Schneider; J. Evans; K. Pinard (2009). The Internet – Illustrated. Cengage Learning. ISBN 0538750987. Retrieved 2015-08-15. ^ K. G. Coffman & A. M. Odlyzco, Optical Fiber Telecommunications IV-B: Systems and Impairments, published by Academic Press, 22 May 2002, 1022 pages, Optics and Photonics, ISBN 0080513190, (edited by I. Kaminow & T. Li) [Retrieved 2015-08-15]. ^ R. Oppliger (2001). Internet and Intranet Security. Artech House. p. 12. ISBN 1580531660. Retrieved 2015-08-15. ^ H. Bidgoli, ed. (2004). The Internet Encyclopedia. 2: G–O. John Wiley & Sons. ISBN 0471689963. Retrieved 2015-08-15. ^ "Lawrence Roberts Manages The ARPANET Program". Living Internet.com. Retrieved 6 November 2008. ^ John Markoff (20 December 1999). "An Internet Pioneer Ponders the Next Revolution". The New York Times. Archived from the original on 22 September 2008. Retrieved 20 September 2008. ^ a b "Paul Baran and the Origins of the Internet". RAND corporation. Retrieved 29 March 2011. ^ "The accelerator of the modern age". BBC News. 5 August 2008. Retrieved 19 May 2009. ^ Evans 2018, p. 116. ^ Roberts, Lawrence G. (November 1978). "The Evolution of Packet Switching". Retrieved 9 April 2016. ^ "Donald Davies". thocp.net ; "Donald Davies". internethalloffame.org. ^ M. Ziewitz & I. Brown (2013). Research Handbook on Governance of the Internet. Edward Elgar Publishing. p. 7. ISBN 1849805040. Retrieved 2015-08-16. ^ "Lawrence Roberts Manages The ARPANET Program". Living Internet. 7 January 2000. Retrieved 5 September 2017. ^ a b "IMP -- Interface Message Processor". Living Internet. 7 January 2000. Retrieved 5 September 2017. ^ "Lawrence Roberts". Encyclopædia Britannica. Retrieved 5 September 2017. ^ a b Roberts, Lawrence G. Dr (November 1978). "The Evolution of Packet Switching". Retrieved 5 September 2017. ^ a b Gillies, James; Cailliau, Robert (2000). How the Web was Born: The Story of the World Wide Web. Oxford University Press. p. 25. ISBN 0192862073. ^ "Inductee Details - Donald Watts Davies". National Inventors Hall of Fame. Archived from the original on 6 September 2017. Retrieved 6 September 2017. ^ "Brief History of the Internet". Internet Society. Retrieved July 12, 2017. ^ "Looking back at the ARPANET effort, 34 years later". February 2003. Retrieved 5 September 2017. ^ Heart, Frank; Kahn, Robert; Ornstein, Severo; Crowther, William; Walden, David (1970). "The Interface Message Processor for the ARPA Computer Network" (PDF). AFIPS Proc. 36: 565. doi:10.1145/1476936.1477021. ^ Wise, Adrian. "Honeywell DDP-516". Old-Computers.com. Retrieved 21 September 2008. ^ Lukasik, Stephen J. (2011). "Why the Arpanet Was Built". IEEE Annals of the History of Computing. 33 (3): 4–20. doi:10.1109/MAHC.2010.11. ^ "Charles Herzfeld on the ARPANET and Computers". About.com. Retrieved 21 December 2008. ^ Brand, Stewart (March 2001). "Founding Father". Wired (9.03). Retrieved 31 December 2011. ^ "Shapiro: Computer Network Meeting of October 9-10, 1967". stanford.edu. ^ Jessica Savio (1 April 2011). "Browsing history: A heritage site has been set up in Boelter Hall 3420, the room the first Internet message originated in". Daily Bruin. UCLA. ^ Chris Sutton (2 September 2004). "Internet Began 35 Years Ago at UCLA with First Message Ever Sent Between Two Computers". UCLA. Archived from the original on 8 March 2008. ^ "NORSAR becomes the first non-US node on ARPANET, the predecessor to today's Internet". NORSAR (Norway Seismic Array Research). Archived from the original on 11 September 2017. Retrieved 14 November 2017. ^ Fritz E. Froehlich; Allen Kent (1990). "ARPANET, the Defense Data Network, and Internet". The Froehlich/Kent Encyclopedia of Telecommunications. 1. CRC Press. pp. 341–375. ISBN 978-0-8247-2900-4. ^ Stacy, Christopher C. (1982-09-07). "Getting Started Computing at the AI Lab". ^ Kirstein, Peter T. (July–September 2009). "The Early Days of the Arpanet". IEEE Annals of the History of Computing. 31 (3): 67. doi:10.1109/mahc.2009.35. ISSN 1058-6180. ^ Abbate, Janet (11 June 1999). Inventing the Internet. Cambridge, MA: MIT Press. ASIN B003VPWY6E. ISBN 0-262-01172-7. ^ "Milestones:Birthplace of the Internet, 1969". IEEE Global History Network. IEEE. Retrieved 4 August 2011. ^ "Milestones:Inception of the ARPANET, 1969". IEEE Global History Network. IEEE. Retrieved 4 August 2011. ^ Tomlinson, Ray. "The First Network Email". BBN. Archived from the original on 6 May 2006. Retrieved 6 March 2012. ^ Steven King (Producer), Peter Chvany (Director/Editor) (1972). Computer Networks: The Heralds of Resource Sharing. Archived from the original on 15 April 2013. Retrieved 20 December 2011. ^ The X-Files Season 5, Ep. 3 "Unusual Suspects". ^ Season 2, Episode 11 "2πR"
^ Season 3, Episode 12 "Aletheia"
^ "BBC News - SCI/TECH - Hacking: A history". bbc.co.uk. ^ "Hobbes' Internet Timeline - the definitive ARPAnet & Internet history". zakon.org. Carr, Stephen; Crocker, Stephen; Cerf, Vinton (1970). Host-Host Communication Protocol in the ARPA Network. 1970 Spring Joint Computer Conference. AFIPS Proc. 36. pp. 589–598. doi:10.1145/1476936.1477024. RFC 33. Ornstein, Severo; Heart, Frank; Crowther, William; Russell, S. B.; Rising, H. K.; Michel, A. (1972). The Terminal IMP for the ARPA Computer Network. 1972 Spring Joint Computer Conference. AFIPS Proc. 40. pp. 243–254. doi:10.1145/1478873.1478906. McQuillan, John; Crowther, William; Cosell, Bernard; Walden, David; Heart, Frank (1972). Improvements in the Design and Performance of the ARPA Network. 1972 Fall Joint Computer Conference part II. AFIPS Proc. 41. pp. 741–754. doi:10.1145/1480083.1480096. "Arpanet" is the seventh episode of the second season of the American television drama series The Americans, and the 20th overall episode of the series. It originally aired on FX in the United States on April 9, 2014. The Computer Science Network (CSNET) was a computer network that began operation in 1981 in the United States. Its purpose was to extend networking benefits, for computer science departments at academic and research institutions that could not be directly connected to ARPANET, due to funding or authorization limitations. It played a significant role in spreading awareness of, and access to, national networking and was a major milestone on the path to development of the global Internet. CSNET was funded by the National Science Foundation for an initial three-year period from 1981 to 1984. Elizabeth Jocelyn "Jake" Feinler is an American information scientist. From 1972 until 1989 she was director of the Network Information Systems Center at the Stanford Research Institute (SRI International). Her group operated the Network Information Center (NIC) for the ARPANET as it evolved into the Defense Data Network (DDN) and the Internet. Frank Evans Heart (May 15, 1929 – June 24, 2018) was an American computer engineer, who, along with a team of others, designed the first routing computer for the ARPANET, the predecessor to the Internet. Gerald Donald is a Detroit techno producer and artist. With James Stinson he formed the afrofuturist techno duo Drexciya, and he is the main member of Dopplereffekt. The Interface Message Processor (IMP) was the packet switching node used to interconnect participant networks to the ARPANET from the late 1960s to 1989. It was the first generation of gateways, which are known today as routers. An IMP was a ruggedized Honeywell DDP-516 minicomputer with special-purpose interfaces and software. In later years the IMPs were made from the non-ruggedized Honeywell 316 which could handle two-thirds of the communication traffic at approximately one-half the cost. An IMP requires the connection to a host computer via a special bit-serial interface, defined in BBN Report 1822. The IMP software and the ARPA network communications protocol running on the IMPs was discussed in RFC 1, the first of a series of standardization documents published by the Internet Engineering Task Force (IETF). The Network Control Program (NCP) provided the middle layers of the protocol stack running on host computers of the ARPANET, the predecessor to the modern Internet. NCP preceded the Transmission Control Protocol (TCP) as a transport layer protocol used during the early ARPANET. NCP was a simplex protocol that utilized two port addresses, establishing two connections, for two-way communications. An odd and an even port were reserved for each application layer application or protocol. The standardization of TCP and UDP reduced the need for the use of two simplex ports for each application down to one duplex port. Raymond Samuel Tomlinson (April 23, 1941 – March 5, 2016) was a pioneering American computer programmer who implemented the first email program on the ARPANET system, the precursor to the Internet, in 1971; he is internationally known and credited as the inventor of email. It was the first system able to send mail between users on different hosts connected to ARPANET. Previously, mail could be sent only to others who used the same computer. To achieve this, he used the @ sign to separate the user name from the name of their machine, a scheme which has been used in email addresses ever since. The Internet Hall of Fame in its account of his work commented "Tomlinson's email program brought about a complete revolution, fundamentally changing the way people communicate".